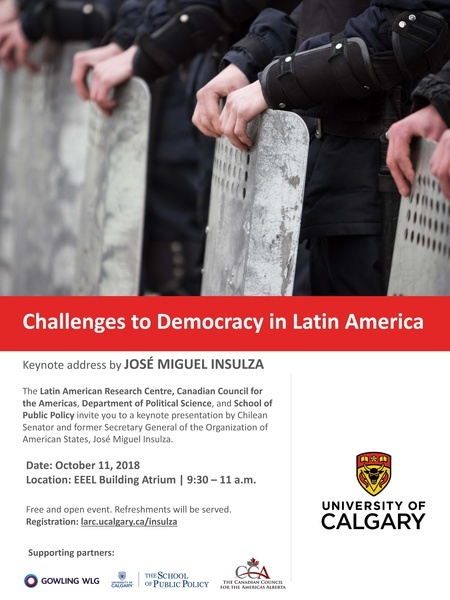 The Latin American Research Centre, CCA Alberta, Department of Political Science, and School of Public Policy invite you to a keynote presentation by Chilean Senator and former Secretary General of the Organization of American States, José Miguel Insulza. José Miguel Insulza has a law degree from the University of Chile and postgraduate studies from the Latin American Social Sciences Faculty and the University of Michigan. He has an extensive career as professor and politician. In Chile, he has been Minister of Exterior, Secretary General of the Presidency, Minister of Interior, and Vice-president. Insulza was elected OAS Secretary General in 2005 and 2010. Location: EEEL Building Lobby | 9:30 – 11 a.m.